It’s an established fact that Merrily Cooper, married Isaac Joules (or Choles as it was written in the register) in Wiltshire in 18031. What isn’t so well known is that Merrily (or Morrely) Cooper was baptised in Tetbury, Gloucester in 1783 to parents Henry & Ciberina Cooper2. Very little is known or can be confirmed regarding the lineage of Henry & Ciberina Cooper, but the first clues may appear one year before, and two years after the baptism of Morrily; A Penelope White is baptised in Luckington, Wiltshire in April 17823 and then in October 1785, a Kezia White is baptised in Wokingham, Berkshire4. Why do I believe all this to be important you may ask? Well, Morrely’s parents, as aforementioned, appear to be a Henry & Ciberina Cooper, Penelope White’s parents are listed as Henry & Sabina White, while Kezia White’s parents are listed as a Henry & Syberana White. Are they one and the same couple, making Morrely, Penelope & Kezia sisters? There are strong indications that they are. The travelling ground of the three baptisms – Gloucestershire, Wiltshire & Berkshire – are all in relatively close proximity and Ciberina, Syberana & Sabina are all relatively unique, yet similar names. Perhaps her surname was White and she was not “officially” married to Henry in the eyes of the Church? Questioning further (although it appears unlikely on first investigation), perhaps she was actually the Cooper and Henry’s surname was White? At this point in time, it’s still unknown. Further confirmation of theses Whites potentially being Coopers or at the very least being very closely connected to the Coopers comes in the form of a settlement order dating from 1815 in Boreham, Essex. A Kissee White, aged 27, with two children under 10 (our Kezia White, above? ), is to be found travelling with an Elisha Cooper (ratcatcher), his two apparent sons, Solomon (25), Dickie (8) and daughter Trinity (16). 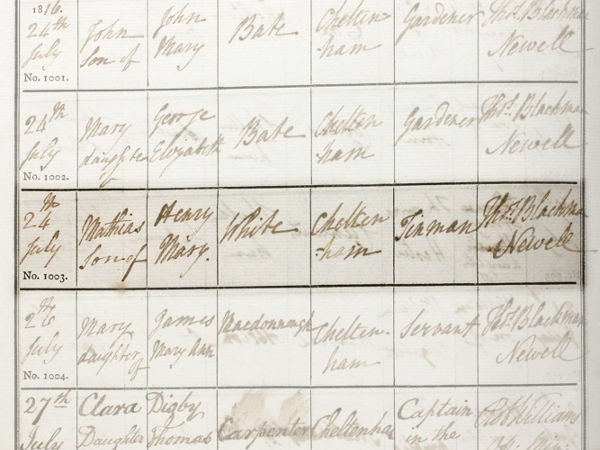 It would appear that Kissee White was actually Solomon Coopers partner and this can all but be confirmed in the baptism of a Forrestina Cooper in Walthamstow, Essex in 18095, where Solomon & Kissey are confirmed as parents, six years prior to the aforementioned settlement order. Although the settlement order in 1815 lists Kissee as having two children under 10, there is some confusion as to who those two children are. Forrestina had to one of her children present, because although she is not named, she would have been 6 in 1815. What is not clear is whether there is an as yet, undiscovered child, or whether whoever wrote the settlement order got confused with who the parents of “Dickie” were. This confusion is aroused with the discovery of the apparent baptism of a Duke Cooper to Solomon & Kezia Cooper, in Harrow, Middlesex in 18076. This surely has to be the “Dickie” mentioned in the above 1815 settlement order as he is of the right age and “Dickie” sounds awfully like the nickname that may be given to a “Duke”. With this union between Solomon Cooper & Kissee/Kezia White, and now having the knowledge that Kezia’s parents can appear to be found using both the Cooper & White surname, it isn’t too far to jump to the reasoning that Solomon & Kezia’s union may have been between cousins (which as we know is common with the Romany) as perhaps Solomon’s father Elisha Cooper and one of Kesia’s parents – whether it be Henry or Siberana/Sabrina/Syberina – were brothers or brother and sister.